From facilitating access to commercial buildings and apartments to serving as a notification device in an emergency, intercoms continue to provide an important security function. Fanvil has developed a line of intercoms that affordably meet notification needs with the latest in technology and functionality. Read more about the Fanvil i12 SIP Audio Intercom, an excellent choice for a variety of applications. 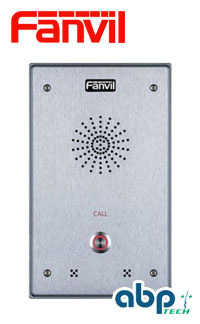 The Fanvil i12 SIP Audio Intercom is an excellent choice for a variety of environments and applications. It supports two output short circuits for video surveillance and alarm light and two input short circuits for door phone button and emergency button. Supports REC out connect port and connects with audio input port of camera or digital recording equipment that yields 24-hour monitoring. Connect the Fanvil i12 SIP Audio Intercom with active speaker or loudspeaker to broadcast an emergency message or music. Fanvil i12 SIP Audio Intercoms are water-proof, dust-proof and have a strike-proof design which prevents malicious damage from vandals and the like. IP65 and IK10-rated – with the ability to withstand temperatures of down to -40-degree Celsius – Fanvil’s i12 is the perfect audio intercom device.